I am pleased to announce that WeatherCat is running on an Apple Watch. Not the real Apple Watch, mind you, but the Apple Watch Simulator. The Apple Watch works as an extension of a paired iPhone. if you have the new WeatherCat on your iPhone, you can view weather data on your Apple Watch. Your displayed data comes from the first two rows on the iPhone WeatherCat*. The displayed watch weather data is updated in synchrony with the iPhone WeatherCat data even when you are using another app on your iPhone. It's not pretty yet, but it works. I will have to wait until the Apple Watch is out before submitting the new version of WeatherCat for the iPhone. In the meanwhile, if you purchase an Apple Watch and would like to beta test the new app, send me your email address. *Savvy iPhone WeatherCat users use the Edit function to arrange the rows in any order. Dear Grand, Blick, Stu, and WeatherCat gadget fans, . . . . In a word . . . . KEWL!!!! I must confess though that isn't the app that is going to get me to rush out and buy an Apple Watch, my old Casio is doing just fine . . . . .
Are you kidding? Your Casio might track the time, but in no way can it tell you what's up with WeatherCat. I figure you for a $10,000 gold unit as soon as you sort your battery drain issue properly. I am looking for more "WeatherCat for the Apple Watch" beta testers. We have been in beta on the actual Apple Watch device for some time. If any WeatherCat fans have purchased an Apple Watch and would like to comment on the beta version of WeatherCat for the Apple Watch, send me your email address. 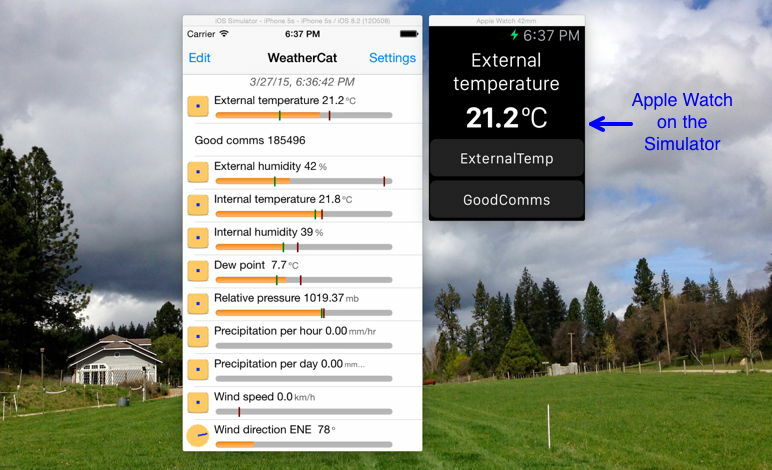 This is your big chance to show off your weather station on your Apple Watch. Dear Grand and WeatherCat users who can tell the time, . . . . I am looking for more "WeatherCat for the Apple Watch" beta testers. We have been in beta on the actual Apple Watch device for some time. Congratulations on the continued success on the project! Alas, even if my venerable Casio is down for the moment in need of a new battery, I have too many other "expensive hobbies" to indulge in an Apple Watch at this time. This is your big chance to show off your weather station on your Apple Watch. A "big chance" on a tiny screen? OTOH, if some one will buy me a watch, I'll be happy to test the app. Probably still won't actually wear the "watch", however. Did this ever come to fruition? I'd be interested! I am looking for more "WeatherCat for the Apple Watch" beta testers. We have been in beta on the actual Apple Watch device for some time. . . .
First, let me welcome you to the WeatherCat forum! I had a "WeatherCat for the Apple Watch" working and being used by a WeatherCat enthusiast. Along comes Apple with an update to watchOS 2.0. This is not your simple tweak or two. It's a "forget everything that you did and do it the new way" re-write. Other projects have delayed the re-write. Since I've already forgotten everything I did and will have to learn how to do ti the new way anyway, it will probably be a while before it comes to fruition (again). Dear Grand and WeatherCat "disillusioned with Apple" types . . . I sure am sorry to hear that Apple did something nasty like this to you. I wish I could say I was surprised . . .
Repeat after me . . . . Oh how I really miss Steve Jobs!! You do good work and when you get around to Watch 2.0 it will be good too. WeatherCat for Apple Watch Redux (version 1.5) is ready for beta testing. Send me your email address if you want to try it. If you don't have an Apple Watch, send me your email anyway. I need the WeatherCat for iPhone portion tested too. The iPhone portion has the same features and interface as the store version (1.4), but the internals have changed to accommodate the Apple Watch. I've tested it and would like external verification. If it doesn't work for you, you can always delete this beta version of WeatherCat on your iPhone and reinstall the official release from the Apple iTunes Store. I'll send you my email addy if you'll send me a Watch! The cheapest version will be fine!